Styles Taught:Every guitar style for electric, acoustic and classical guitar for any level. I’m Vincenzo. I teach in my Studio in Paddington and in the Eastern Suburbs area of Sydney and can travel further for lessons. I am a Italian flamenco and jazz professional guitarist. I have a good international experience as a professional musician as a guitar teacher, playing guitar since I was 12 years old. 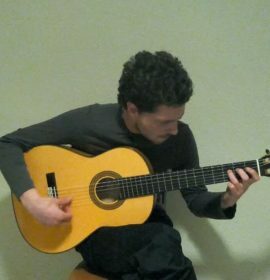 I have played any kind of music with guitar, starting from rock and metal stuff to to jazz and flamenco/classical genres. I could teach you any kind of skills for any kind of styles and guitar types. I’m very friendly and funny guy who loves to stay in touch with people. I worked with a few cultural associations to organize any kind of parties: I worked with kids for theatrical reading shows, cultural events and dining events. I think this could be a great opportunity for me to extend my international experience working here in Sydney and for you is a good chance to have a foreign professional musician-teacher. Experience, professionalism and social skills. If you are look for this kind of a teacher I’am that one. The lessons with Vincent are all fine. He has been helping my progress move along very quickly. Thanks for Sydney Guitar Lessons for putting us in contact!